Add this griddle to your kitchen arsenal! Try this large Presto Pro 22-Inch Electric Griddle for preparing delicious meals for your family. It's non stick surface is great for easy cooking and quick clean up, and the unit is dishwasher safe. Fully immersible without heat control. 22-inch cooking surface Is large enough to cook for a large family or a crowd. 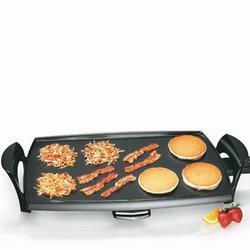 Non stick surface Provides easy turning of pancakes and sandwiches, and quick clean up after the meal. Washable And fully immersible in water with the heat control removed from the unit. Attractive style Makes it suitable for use at the dining room table so you can cook "seconds" while the family is eating the first go-round.